While most are familiar with management of the symptoms of trigger finger employing or using surgery and injection, what about the use of a splint for treatment? Is there evidence to suggest this may be an effective intervention for trigger finger for our patients? In the last several years, there have been many studies that have looked at the use of a splint in the treatment of trigger finger. All of the studies found decreased pain and triggering with the use of a splint. In fact, one of the studies found that 87% of the participants did not require surgery or a steroid injection one year after completing the splinting regimen. Additionally, a literature review has found that splinting in conjunction with a steroid injection had more successful symptom resolutions than splinting or an injection alone. Current research evidence has found a decrease in symptoms with use of a splint at the metacarpal phalangeal (MCP) joint, the proximal interphalangeal (PIP) joint, and the distal interphalangeal (DIP) joint of the digits and at the interphalangeal joint (IP) of the thumb. A clinical recommendation for splinting is to splint the joint that allows for smooth tendon glide and is the least restrictive option. The Oval-8 Finger Splint is a convenient, low-profile, comfortable method for splinting the PIP or the DIP joint of the digits and the IP joint of the thumb. The Oval-8 comes in many sizes for an appropriate fit and allows for the use of the hand with minimal interference of the splint. 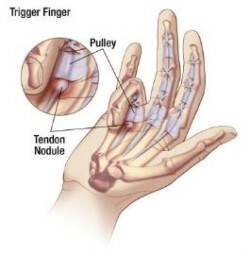 Are you looking for more information on Trigger Finger? 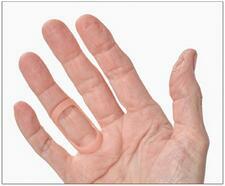 Check out the consumer blog What Can I Do About My Trigger Finger?